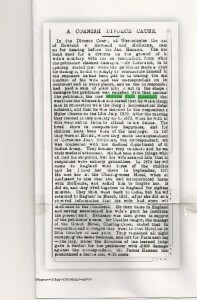 Jacky Fogerty has uncovered a newspaper report of Rev William John Rowland’s divorce from Annie Ellen Domville in 1881. We believed that he had spent some of his fortune obtaining the divorce. It now appears that he received damages of £400 from the co-respondent Dr Cornelius John McKenna. 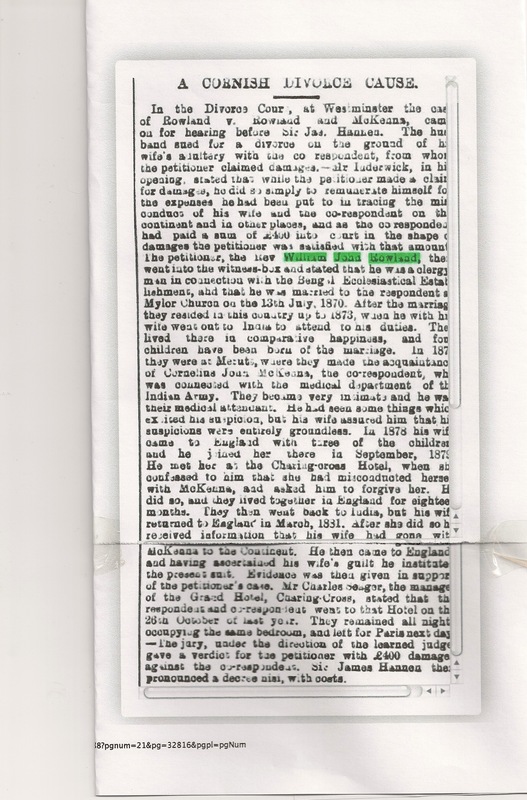 The report gives the evidence from the hearing-he was their doctor in India. In 1878 she admitted her misconduct to her husband, and he forgave her whilst staying at the Charing Cross Hotel. But she then eloped with Dr McKenna in 1881. Evidence was given by the manager of the Grand Hotel, Charing Cross that the couple “remained all night, occupying the same room, and left for Paris the next day”. Clearly Charing Cross was a hotbed of passion. Sir James Hannen directed the jury to award Rev WJ Rowland £400 damages and pronounced a decree nisi. This entry was posted in Book on 21 January, 2015 by Richard.